While math is not one of my many skills, I easily managed to fully enjoy ten 10-minute plays by 10 playwrights featuring six actors in 21 roles, directed by two talented women on one stage -- Barrington’s St. Germain Stage. Heavy snow (hmm, sounds familiar) postponed my attending opening weekend. Fortunately, Barrington and I rescheduled. All worked out well, as last Sunday was a balmy 38 degrees in Pittsfield. Recent journeys up north in the past few months by several Spotlight writers substantiate the fact that the Berkshires do NOT close their doors in December and reopen in May. Apparently, lots of other theatre goers know this, because there was not a single empty seat in the theatre. 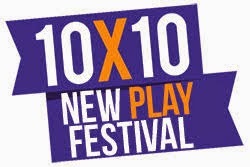 10x10 is a jam-packed two-hours of near rapid-fire mini-plays. Each “playette” (is that a word?) is complete and not connected to any of the other plays. The six actors (three men, three women) double as stage crew. The playwrights are experienced with resumes to prove it, as are the actors who are all Equity except for one. This is a very talented sextet who work well as an ensemble. Most of the plays in Act I are comedies. Act II provides some drama. The stories feature just two characters for the most part. One play immediately follows another, no curtain calls, just next, next, and next. Certainly, it is impossible to enjoy all ten plays. Out of my own seven “nominees,” one comedy and one drama tie for “best play.” Sorry, I can’t help the analogy to the Oscars, aired later that same day. The plot of “Mandate,” by Kelly Younger, is a very funny forced “bromance” by the wives of two disparate men who have just met. One man begs to be the other’s BFF. The humor oozes from the awkwardness. Playwright James McLindon’s “Broken” pits two political prisoners in one small cell. The situation, the place, the era do not matter. It’s raw and dramatic. You might think...a play that’s only 10 minutes? How good could it be? When 10 minutes is all you need, it can be very good at Barrington Stage.